The Valley Club filed for bankruptcy in November 2009 because of legal bills and liabilities. (CNN) -- A swim club at the center of a racial discrimination controversy last year has been sold in a bankruptcy court auction. 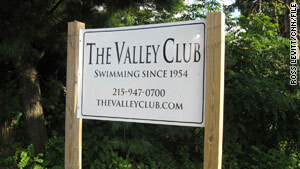 The Valley Swim Club in Huntingdon Valley, Pennsylvania, a sold for $1.46 million to Congregation Beth Solomon of Northeast Philadelphia after several hours of "spirited" bidding by five parties on Thursday, according to Terry P. Dershaw, the swim club's bankruptcy trustee. Vlad Tinovsky, the synagogue's attorney, could not say what the congregation intends to do with the 10.5-acre property in the Philadelphia suburb. "The congregation is very excited, but we are not yet sure how we intend to use it. We would like to use it within its existing recreational and educational nature," Tinovsky told CNN. The swim club filed for bankruptcy in November 2009 because of legal bills and liabilities resulting from the club's decision to cancel swimming privileges to black and Latino children from the Creative Steps Day Care center. The club's decision to revoke the swimming privileges sparked controversy and garnered high profile media attention. The Creative Steps Day Care children -- who were in kindergarten through seventh grade -- went to the Valley Swim Club on June 29 after the center's director had contracted the use of the club once a week, but after members complained, the private swim club canceled their deal with the day camp and returned their $1,950 check. The swim club said safety and crowding prompted the cancellation, not racism. The club was hit with a lawsuit from the U.S Justice Department and a state Human Relations Commission investigation. Antonio Wright, the supervisor and program coordinator at Creative Steps, said the center is happy the pool has been sold but still upset over last year's controversy. "Creative Steps is ecstatic at the verdict, but we're sad that it took such an unfortunate situation involving children to occur to show that racism is still alive," Wright said. John Deusler, the swim club's former president, did not comment on the sale of the property.